"The exhibits in Museum offer rare, studied glimpses of a world we too often ignore. We begin with a legless man in a wheelchair, an oncoming bus; we see parking lots filled with broken glass, children, hypodermic needles; a good friend-turned-junkie; a confrontation between strangers at a train stop; and a woman, Marilyn Monroe's daughter, reminds us why we shouldn't close down our mental institutions. This is just the first half of the tour, which in all truth serves to mentally prepare us for the second. When at last we close this book and return, blinking, to our own safe homes, we are, like the brutally rendered poor in David Peak's powerful collection, bare and gasping for release." "Museum of Fucked is an implosive and brutal study, the results of which are clear and foreboding: Cruelty exhibited--and the self-protective indifference it inspires--can turn a metropolis into a necropolis. Watch through the window, now. We're almost there." "David Peak builds people – observing and then rejecting their forms, making them into another or something else entirely. Museum of Fucked is this – the population gone astray and re-rendered in all their frantic delusions, Peak’s sullen thick words, people as they should be written." "In this offering from David Peak--a writer whose prose and poetry ekes out in the literary world like the good custard at the edge of a cannoli--the narrator comes to a central truth about his Chicago (and dare I say our) world: all its collective elements, 'they are small and unmanageable.' From the fat, baseball bat-wielding child-tormentor to the homeless guy waving a morning 'god bless,' so too does the prose of this chap wave a dream your way. Tame it; I dare you." --Jamie Iredell, author of Prose. Poems. Novel. "Beautifully brutal and written in a simple and clear style, Museum rings true of Oscar Wilde, that we are all in the gutter, but some of us are looking at the stars.'" "If we build museums to remember who we were--and who we wish we had been--what then to make of David Peak's Museum of Fucked, with its curated Chicago grit, its exhibitions of human failure collected on the city's streets and pressed flat between these pages? One read is all it takes to see how Peak's specimens resist the pin and prick of his sharp, clipped language, so that always they threaten to escape his control, to leap from their paragraphs and back into our lives. This is book as museum, sure, but also as emergency siren, as distress beacon, as a warning to be ignored at our own peril." "'I am not a bad person,' becomes a brief refrain in David Peak's slim, messed up bloodblister of a text. In the spare repetition, and in the clean and brutal sentences of Museum of Fucked, a guilt is hiding, a paranoia. The streets are no longer safe for cats, nor is Craigslist, nor is the whitespace of the mind behind the mind all here throughout: a sublime and eeriely pleasing emotional amalgam that makes Peak's freakshit calmly scream: not toward you, as a reader, but into: like a bullet sent through skin in one hole, then once entered, split in ten. Watch out." + Museum of Fucked by David Peak. Limited print. Sold Out. 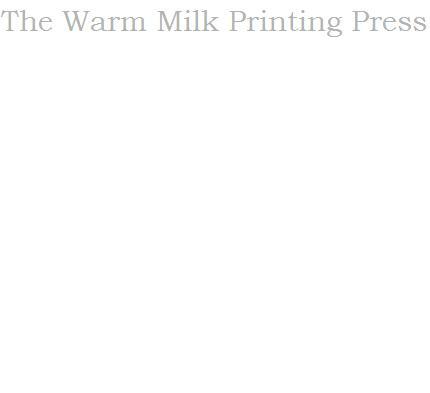 Warm Milk Press is the publisher of handmade chapbooks.